Entrez dans la peau d'un chef espagnol et apprenez à préparer la paella, le plat phare de Valence, durant un cours de cuisine interactif. Sortez de la ville pour vous rendre dans une ferme traditionnelle où un professeur de gastronomie vous dévoilera les secrets qui se cachent derrière ce célèbre plat de riz et de fruits de mer. Immergé dans un paysage d'orangers et de rizières, asseyez-vous pour savourer une cuisine maison et vivre une expérience valencienne authentique. WOW! This experience with Rafa was Maria was truly the highlight of our entire trip to Spain. We would highly recommend. Everything was so well organized, planned, and put together. Once you are promptly picked up from your hotel/hostel by Maria, you are driven about 30 minutes outside of Valencia to a home in the middle of an orange field where you meet Rafa, aka Professor Paella. Your work stations are set up, and you're immediately offered snacks and drinks. The entire experience was filled with laughs, great food, new friends, and a new love for the art of creating paella. Fantastic cooking class...from the moment we were picked up by Maria, we had a great time. As we drove from where we were staying in town and made our way out to Albufera, Maria gave us loads of information about the city and it's history, the culture, the politics and more. As we got closer to the park, she explained to us a bit about why paella originated in the area you will have to take the class to know the answer! She also surprised us by telling us up-front that the real Valencian Paella does NOT contain seafood, chorizo, peas, onions, garlic or peppers. Well...we always thought we knew so much about food....we had to learn from the beginning. The farmhouse where the cooking class takes place IS the perfect place to learn about paella, from the beginning. Forget everything you thought you knew....start over. It's well worth it! The location is so beautiful, and peaceful. From the roof there are stunning views across the orange groves towards the rice fields. The sweet scent of oranges linger in the air, as the house is surrounded by them. we even climbed into the trees and took a bag home....we made the best orange juice for breakfast the next morning with these! Rafa was such a great guy to learn from - we have two teenage boys and as a former high school mathematics teacher, he had no trouble keeping them entertained and totally engaged. He spoke Spanish the entire time, and Maria translated. This was not at all awkward - it was done so smoothly that it made no difference at all. We learned so much, and enjoyed every moment! We enjoyed great wine, and of course...an amazing paella. Honestly, it was SO good! This tour was awesome. However, the cookbook they provided afterwards was not accurate and did not tell you the exact steps to make paella at home. I recommend you video the steps to make sure you can do it again at home (or buy a real cookbook). We had a wonderful time. Rafa and his team were friendly informative and very entertaining. This was one of the highlights of our month in Valencia! We attended with some friends and were joined by two couples from Holland. From the beginning, Rafa communicated clearly with us about pickup from our apartment. 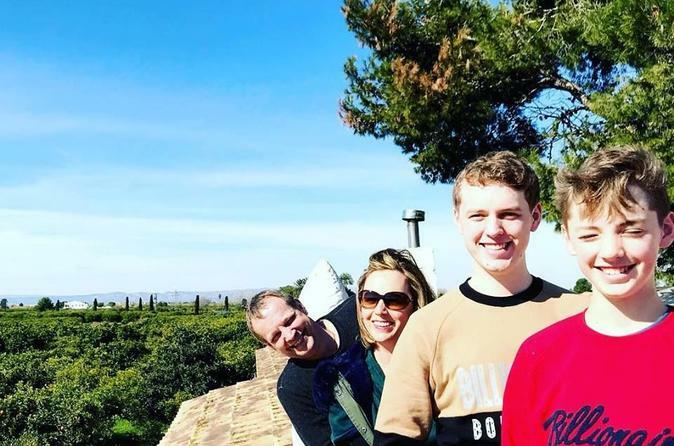 We had a pleasant drive with Maria out to a lovely traditional farmhouse south of Valencia. The farmhouse was surrounded with orange trees and gardens. Rafa immediately made us feel at home, offering all kinds of beverages, including wine and beer. Maria did translation for Rafa and they were a delightful pair, warm, engaging and funny! Both were steeped in both the traditions of paella and the techniques for making true Valencian paella. We divided into teams of four, with each team making a pan of paella. As we worked, Rafa coached us and both he and Maria shared the traditions of cooking and eating paella. While our paella was cooking, we were served DELICIOUS and beautiful tapas and Valencian wine on the patio. Finally, after the mandatory 17-minute cooking time, we got to eat our fabulous paella. Although we weren't sure we could eat another bite, out came a plate of freshly sliced oranges and a traditional Valencian pudding. Rafa and Maria were kind enough to take pictures of us throughout the day and sent us home with recipes for the food we had cooked, including the amazing Spanish tortilla tapa prepared by their colleague. I couldn't recommend this experience more highly! It is worth every penny! My wife and I took 4 cooking classes during our trip to Spain and this was our personal favorite. Raf and his team were such a delight and we felt like it was the most authentic experience. We were pampered, picked up, and taken to Riola to take the private class and couldn't have been happier. We loved the authenticity and intimate setting, versus the giant 15 student classes we also took in Barcelona and other parts of Valencia. We felt like we got a true paella experience and learned all about the history and culture of the dish. AMAZING! The class was one of our most anticipated activities in Spain, which was proven a great one!! The class started by being greeted by Rafa the chef and his super friendly team mate Maria at the hotel pickup point. 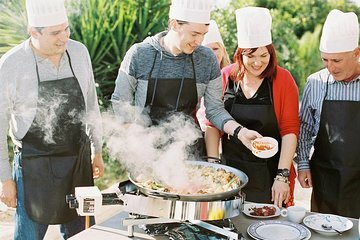 Unlike other cooking classes held in the city centre of Valencia with a big group of students doing one big paella only, we learned the paella making in a farmhouse about 30 mins away from the city in three small groups. Each group did its own paella, meaning that we really tasted what we did by our own hands - we reckon that it was a much better experience with fun. The 3 pans of paella made by the 3 small groups tasted slightly different but were equally good!! The amusing Rafa and team were a big plus of this cooking class: from the origin of paella to the cooking skills, we learned much from them with a lot of laughter - we still remember a real paella should have no seafood with a thin layer of rice. The one in Barcelona or Madrid with a thick layer of rice is faked! It's interesting to know that we were the first group from Hong Kong joining Rafa's class. The class gave us great memory, making our trip to Valencia very worthwhile. Thanks Rafa, Maria and the team!! We can't recommend this excursion enough. Unless you are lucky enough to have friends or relatives with a farm in the country then you will never have an opportunity to experience a Sunday paella feast like this. Maria and Rafa welcome you into their world and share much more than cooking tips. They share their passion and love for their land and culture and introduce you to new friends from around the world. DON'T settle for the intown cooking class. Invest in Maria, Rafa and Roberto and have a memorable experience to last a lifetime. we were picked up on time at the dock and driven about 45 minutes to the countryside to a farmhouse by maria, who would serve as driver/translator/assistant. there we were greeted by master paella chef, raffa. the two worked well together providing tips on the preparation and cooking of the paella as well as the history of the dish. while the paella was cooking we all went outside and enjoyed plates of olives, meats and cheeses, bread and peanuts as well as a delicious frittata. of course, wine was also flowing.we all enjoyed the class, the great sense of humor of raffa and maria, and of course the knowledge of how to prepare true vallencian paella. My husband and I more than enjoyed the day with Maria, Rafa and Miguel. It was so enjoyable, entertaining and very informative. The chemistry between Maria and Rafa was amazing. We also had a great group of people in the cooking class. Would definitely recommend to anyone.